world with compassion, acceptance and bliss. 1. Right View: Understanding how suffering arises in the human mind and the possibility of overcoming it. 2. Right Intention: Developing the intentions of non-violence, letting go and compassion, which reduce suffering of oneself and others. 3. Right Speech: Cultivating truthful, peaceful, kind and meaningful speech . 4. Right Action: Cultivating harmless, honest and faithful behaviors by refraining from killing, stealing and sexual misconduct. 5. Right Livelihood: Following a righteous career that does not harm other living beings. 6. Right Effort: Constantly attempting to maintain good thoughts and habits. 7. 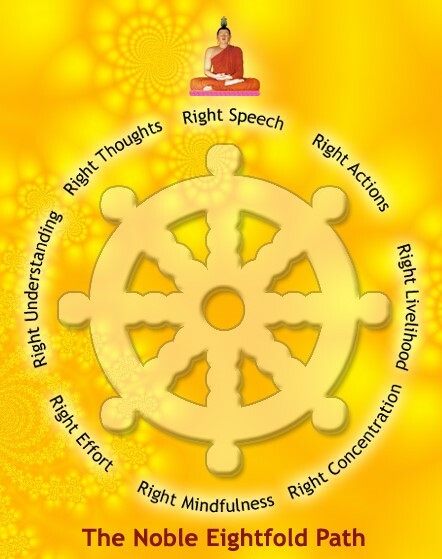 Right Mindfulness: Developing awareness of our body, feelings, the nature of our mind and thoughts. 8. Right Concentration: Developing the ability of concentration of our mind and the settling of the mind into peace and tranquility.